I feel like I keep writing the same thing in this newsletter week after week....feels like summer, tastes like fall! That's certainly the case again this week as the thermometer reads close to 80 degrees and we're harvesting cool fall greens and sweet potatoes for the shares. You know us, we love to wash your veggies so they're squeaky clean when they get to you. BUT, sometimes dirty is better. Why? 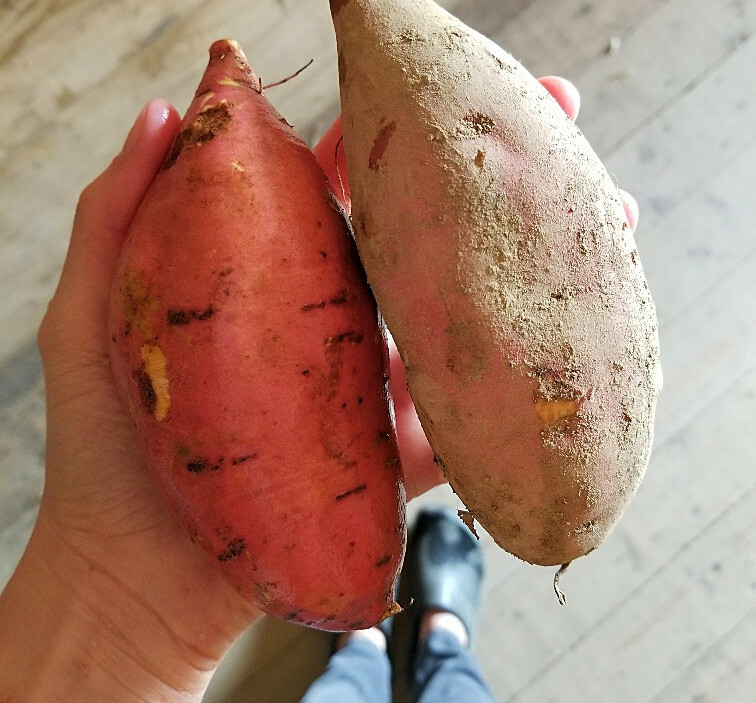 Take these sweet potatoes, for example. They are freshly dug, not "cured" for storage. This means that the skins are thin and the washing cycle will cut up the skin and make them look pretty rough. The dirt provides a protective coating during transport to you. When you get them home, wash them off gently under running water and they'll look beautiful like the potato on the left in the photo below. Sugarloaf Chicory - This looks like a tall, pointy lettuce. But it's not lettuce, it's a chicory. The link here will take you to the radicchio page, and although it's not radicchio, it's a family relative and much of the info is the same. The take-home here: This is an ever-so-slightly bitter green that works great as a salad cut thinly into ribbons and dressed with olive oil, lemon juice, fresh pressed garlic, salt & pepper to taste and cheese. A hard, nutty cheese (Parmesan works great) shaved on top balances out the bitterness. Scallions - What do you think? Did we plant one too many series of scallions this fall, or are you loving their fresh flavor added to all your dishes? They're going into my stir fry tonight! Sweet Potatoes - Dense, sweet, and full of flavor and nutrients. Orange veggies are extremely healthy with their high levels of Vitamin A and beta-carotene. Super simple to prepare! Wash them and stick them in the oven (350F) in a baking dish until soft. Scoop out and top with a pat of butter (my choice) and salt & pepper to taste. Drizzled with olive oil is good too. Storage: Don't wash until you're ready to use them. Keep them on your counter in a warm, dry spot. Uses: Cooked. When to use: Within a week. Cilantro - You probably have your own favorite ways with cilantro. I'm craving the sweet potato recipe below. Japanese White Salad Turnips - They're back! Eat the tops too. Don't forget! Storage: Store the greens and the roots separately in an airtight (plastic) bag in the refrigerator. Uses: Raw/Cooked When to use: Within a week. Baby Arugula - Baby, tender, delicious. Wash gently and don't dress heavily. Storage: In an airtight (plastic) bag in the refrigerator. Uses: Raw/Cooked When to use: Within 3 days.